To remove a diseased appendix, an incision is made in the patient's lower abdomen (A). Layers of muscle and tissue are cut, and large intestine, or colon, is visualized (B). The appendix is located (C), tied, and removed (D). The muscle and tissue layers are stitched (E). Once the diagnosis of appendicitis is made and the decision has been made to perform an appendectomy, the patient undergoes the standard preparation for an operation. This usually takes only one to two hours and includes signing the operative consents, patient identification procedures, evaluation by the anesthesiologist, and moving the patient to the operating area of the hospital. Occasionally, if the patient has been ill for a prolonged period of time or has had protracted vomiting, a delay of few to several hours may be necessary to give the patient fluids and antibiotics. 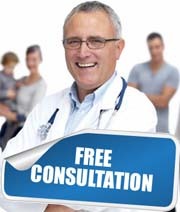 If you are really seeking for the Laparoscopic appendectomy surgery in India, kindly fill up the form for a free consultation by our surgeons. You will be provided with thorough analysis and suggestions regarding Laparoscopic appendectomy surgery in India you are seeking for.